This revolutionary desk chair will change the way you sit. 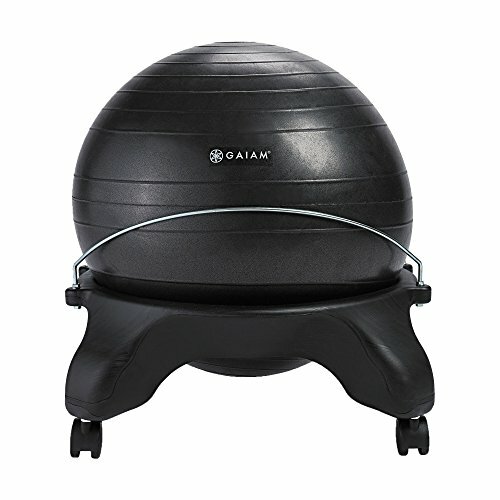 Designed with a work-life balance in mind, the Backless Gaiam Balance Ball Chair provides all-day ergonomic support for a healthier back and stronger core. This exercise ball chair was created by Gaiam with the help of chiropractic pioneer Dr. Randy Weinzoft. This stability ball chair alleviates the aching arms, restless legs, and aching back pain that comes from sitting at a desk for hours by promoting micro movements and engaging your core throughout the day. Without a back rest, the backless balance ball chair encourages great posture while seated and leads to less back pain and a healthier spine. Feel better at your workplace by using this alternative chair that promotes wellness throughout the day. This unique office chair is designed for people between 5' - 5'11" for use at any standard desk. For users that may need an extra boost, the Gaiam Leg Extenders add 2 inches in height to the chair. Please note that for the ball to fit perfectly in the base, it may be necessary to re-inflate the ball once or twice after initial inflation. - 1 Classic yoga ball that can be taken out of the chair base and used separately for exercises.